Millions of people are troubled by unsightly veins. These veins resemble a spider, or a star, with several tiny veins radiating from the center point. They appear like a web-like maze, fine separate lines, or like branches spreading from a single tree trunk. These reddish, bluish or purple thread-like lines can develop on any part of the body, but mostly appear on the thighs or calves. 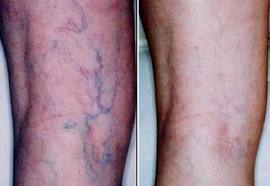 Spider veins are superficial to the skin and are a lot smaller as compared to varicose veins. Since they are dark and very visible, they are a major embarrassment for women. Laser treatment for spider veins is considered as the gold standard in treating these veins. It is a quick, safe and effective method to treat superficial veins. Although laser treatment has been used for more than 30 years, advances in technology have lead to the development of many different lasers. Laser for spider veins treatment involves the use of a focused beam of light. During treatment, the wavelength of light is targeted into the pigment in the blood. The heat from the laser coagulates the blood in the vein and causes it to collapse and seal. Over the next couple of weeks, the vein will disappear and the blood will be removed by the body’s scavenging cells. Newer laser treatments allow the delivery of a precise dosage of energy into each blood vessel without causing any injury to the surrounding skin tissue. During treatment with a Laser for spider veins, patients might experience a slight tingling sensation as the laser works. In case someone is sensitive to pain, a topical local anesthetic will be applied 20 minutes prior to treatment. Depending upon the size and number of veins, 2 to 6 sessions are required. The treatments are generally performed 4 to 6 weeks apart. What are the side effects and potential complications involved? The skin above the veins will have a red, cat-scratch appearance. This normally disappears over the next 2 days. The risk associated with using laser for veins is minimal. Most facilities use state-of-the-art cooling systems, thereby making the treatments low risk and relatively pain-free. Jessica Thomas writes for Advance Medical Systems, a site that connects consumers Laser treatment for spider veins advice they can trust.